David Wells is a lifelong pianist and composer who has served as music director in various churches for over twenty-five years. 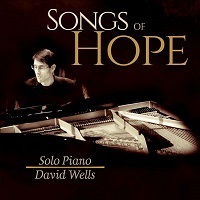 Recorded on a seven-foot Yamaha Grand Piano, Songs of Hope is Wells’ debut album, featuring ten original solo piano compositions intended to lift the spirit and nurture the heart. Inspired early on by Windham Hill Records pianist George Winston, Wells’ own music is noticeably graced by Winston’s influence, as well as that of Jim Brickman, while likewise incorporating his personal jazz background into many of his arrangements. “Selah” opens the album with a warmly flowing arrangement that smoothly rolls along like a scenic hillside in the sunshine. Producing a dimensionally radiant sound quality, it’s easy to envision the composer playing in a chapel as the music resonates throughout the hall. Three seasonal-themed pieces follow next, beginning with “Summer’s End”, a brightly optimistic number that mostly hovers in the higher registers. “Falling Leaves” slips into a more introspective mode, beginning softly at the top and trickling down into the mid-range with bolder exertion. My favorite composition on the album is “Winter’s Chill”, which particularly bears a resemblance to the mood and style of George Winston. Wells lends a steadily focused undercurrent with his left hand, as his right hand moves rapidly in a spinning motion, seemingly recalling that of watching someone hurrying down a winding staircase from above. I can only imagine what a treat it would be to witness this piece played live with its impressive display of intricate finger-work and evocative wintery atmosphere, which effectively conjures imagery of riding through a snowstorm. “Nocturne” is a notably intriguing composition full of expressive twists and turns. Despite its title, I’m more inclined to envision a sunny winter day while listening, especially amid the piece’s dynamically optimistic middle portion that’s decoratively bookended by a touching, heart-warming melody. “Traveling Light” effectively wraps up the album’s title and message with a tender yet spirited arrangement that imparts a sense of hope and optimism. Soulfully elevating yet down-to-earth, the compositions on Songs of Hope generally remain in a happy place while simultaneously creating a space for inner reflection. Even amid the album’s more contemplative moments, Wells’ arrangements are inherently optimistic, open and personal, as well as immaculately arranged with an impeccable sound quality!